NASA’s Mars Atmosphere and Volatile EvolutioN Mission (MAVEN) orbiter will have a front-row seat to watch a dusty spectacle in late 2016. 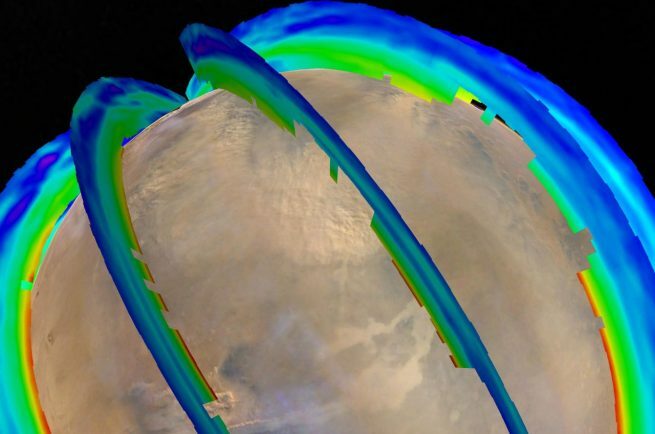 The spacecraft, nearing its second anniversary in Martian orbit, has already gathered a wealth of scientific data about the Red Planet’s atmosphere and is expected to provide crucial insights on the nature of intense dust storms occurring periodically on Mars. MAVEN’s goal is to explore the planet’s upper atmosphere, ionosphere, and interactions with the Sun and solar wind. It has observed Mars in different states, returning scientific data regarding various phenomena. When solar heating warms the Martian atmosphere and causes the air to move, dust lifts off the ground, forming a dust storm. These storms could be very powerful when Mars reaches its perihelion as the sunlight striking the planet will be 20 percent more intense than the annual average. While planet-wide dust storms on Mars are difficult to be predicted exactly, scientists forecast call for severe dusty events in late October 2016 when the Red Planet will be at its closest point to the Sun. Dust storms could help researchers better understand the processes taking place in the tenuous Martian atmosphere. This is MAVEN’s main task, in particular, investigating the loss of the planet’s atmosphere to space. MAVEN’s data proved the Sun and solar wind are able to strip gas from the atmosphere and remove it to space. The spacecraft’s measurements allowed the scientists to conclude that over the history of the planet, this was likely the dominant mechanism for driving the changes in climate. Jakosky said it is becoming clear that any aspect of the history of Mars cannot be considered in isolation. The planet’s environment is an intricately coupled system of complex processes spanning from the deep interior to the upper atmosphere and its interactions with solar wind. “MAVEN has begun to fill in the gap of the top of the atmosphere, and is showing how processes there can affect the planet’s climate, geology, and habitability!” Jakosky noted. Currently, the MAVEN spacecraft and all of its science instruments are operating nominally and science observations are continuing. The orbiter has just been approved for a two-year extended mission that will carry it into late 2018. MAVEN began its primary science mission Nov. 16, 2014, and is the first spacecraft dedicated to understanding Mars’ upper atmosphere. NASA’s Goddard Space Flight Center manages the MAVEN project for the principal investigator at the University of Colorado, Boulder, and for the NASA Science Mission Directorate in Washington, D.C. Lockheed Martin built the spacecraft and is responsible for mission operations.